How Does Aromatherapy Improve the Hot Tub Experience? Posted on March 5, 2018 April 24, 2019 , in Hot Tubs. 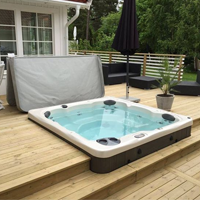 There’s no doubt that most people use their hot tub for rest and relaxation. But are there ways to increase your hot tub’s capabilities to allow you to loosen up and unwind? Absolutely, there are! One such practice is known as aromatherapy. By combining the aromatic properties of essential oils with the features of your hot tub, it’s possible to increase your ability to relax while improving both your physical and psychological well being. Essential oils are composed of volatile aromatic compounds extracted from plants which contain the fragrance associated with the plant materials used. The types of plants that essential oils are obtained from varies widely with compounds being found in herbs, trees, vines and more. Dependent on the species or plant type, essential oils can be derived from a number of different plants parts such as flowers, roots, leaves and fruits. There are a variety of ways to draw out these compounds including distillation, solvent extraction, cold pressing and more. Essential oils can be used as a topical ointment or their vapors can be inhaled. The oils have been known to provide analgesic relief and may exhibit anti-bacterial and anti-inflammatory characteristics. It’s been claimed that essential oils can improve mood and emotions while providing physical benefits. Aromatherapy is known as an alternative medical practice which uses essential oils to promote well being through physical and psychological relief. It’s been thought to have been used as far back as the ancient civilizations of China, Greece, India and Rome. By applying essential oils topically in baths, with massage or by compress, the fragrance can be taken in by the olfactory system and allowed to perform its objective. It’s also possible to diffuse the scents using vaporizers or other tools to allow circulation of the fragrance for its therapeutic qualities. How Can I Use My Hot Tub For Aromatherapy? Essential oils can be purchased in raw form, but before adding these to your hot tub water, you should ensure that they won’t cause any damage to the tub’s finish or plumbing. Essential oils not created expressly for use in a hot tub can result in build ups that may damage different components of the system. If you’re unsure about the safety of using raw essential oils in your hot tub, contact your dealer for advice. Fortunately there are more and more aromatherapy products being marketing specifically for hot tub use. They come in all sorts of forms including the oils themselves, crystals, salts, dissolving capsules, beads, liquids and more. These products can be added directly to the hot tub water creating both a topical application and a diffusion of the fragrance. Different essential oils have different properties which make choosing the correct oil an exercise in knowing what benefit you’re looking to obtain. Here is a list of some the best known oils and their potential benefits. Lavender – Lavender is known as a mood enhancer while promoting relaxation and general well being. Eucalyptus – Eucalyptus oil can open air passages and help with colds, coughs and sinus problems. Peppermint – Peppermint can help stimulate the brain and decrease mental lethargy. It’s been thought to help with memory problems while increasing circulation. Lemon – Lemon and other citrus based oils are thought to reduce stress and depression while improving mental clarity and relaxation. Now that you know how aromatherapy can boost your hot tub experience, learn about the many other wellness benefits hot tubs provide by downloading a hot tub buyer’s guide.